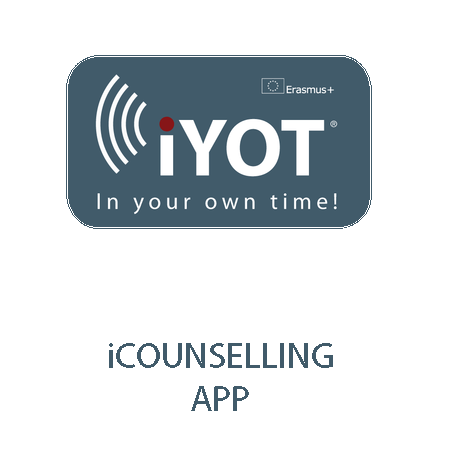 Intellectual Outputs – IYOT: IN YOUR OWN TIME! This document represents the first stage of the project and tries to provide, through the joint cooperation of the 5 partners involved in the project and based on a research conducted in every country to specialists in the counselling area, a series of general aspects and recommendations for counsellors regarding the distance counselling concept and on a series of areas that counsellors must domain related to the acquisition of competences and to increase employability of counselling service users. Career Counselling: Career related challenges such as career exploration, career change, personal career development and other career related issues. Educational counselling: counselling adult students about their studies while studying, counselling about their future studies, the student economic counselling and other more personal issues. Validation of non-formal and informal knowledge: options to acquire or improve new knowledge, skills or competences through different possibilities in the non-formal and/or informal education and how to validate or get recognition of such non-formal and informal knowledge. Communicational aspects: other issues related to improve communication skills and conduct a “humanised” counselling as much as possible. Distance counselling: services provided at a distance by electronic means or delivered using ICT and which may or may not directly involve a counsellor. 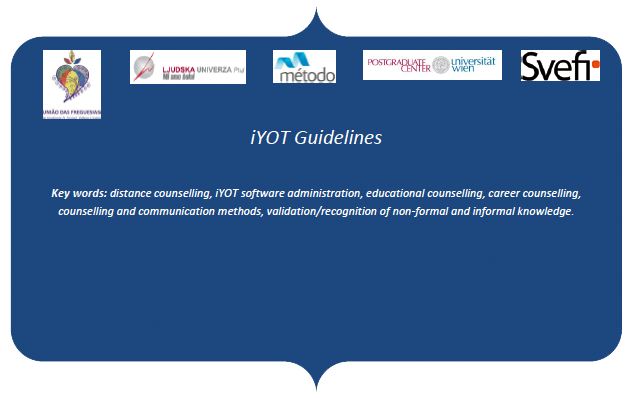 Thus, iYOT Guidelines represent the basic provision for future Training Curriculum addressed to Guidance Counsellors (iYOT Counsellors), a group formed by professionals such as adult educators, teachers or workers in the adult education field, so that they can gain knowledge and skills to be able to administer, manage and provide counselling by using the web-based software system with an innovative mobile application (iYOT Software). The Guidelines will become national resources to anyone who wish to develop their ability or skills and active involvement in education or labour market. A Curricula (50 pages minimum) for Training course to train Adult Educators/teachers/mentors/peers upon how to implement the iYOT nationally. Curricula for 5 modules training course (1.adult education, 2.labor market and mobility opportunities, 3.counseling and communication methods, 4. recognition of non-formal knowledge, 5. iYOT mobile application administration). 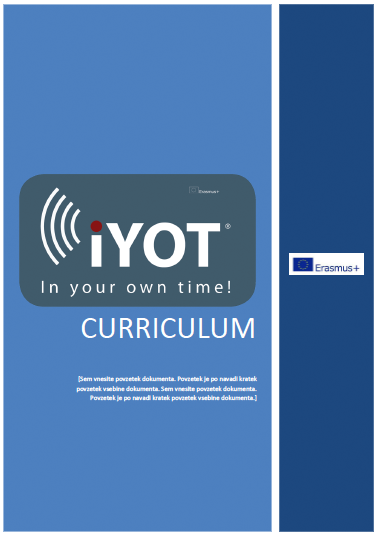 Each iYOT partner delivered one module (1. Sweden, 2. Austria, 3. Portugal, 4. Slovenia and 5. Spain). Resources in the form of reading lists and material Compendium together with iYOT Certificate for completion of the Training for Mobile Guidance Counsellors has been prepared. Each participating organisation identified a trainer that prepared learning sessions upon how to run the module which their organization has developed. Curricula is available as open source; online and via e-learning platform. 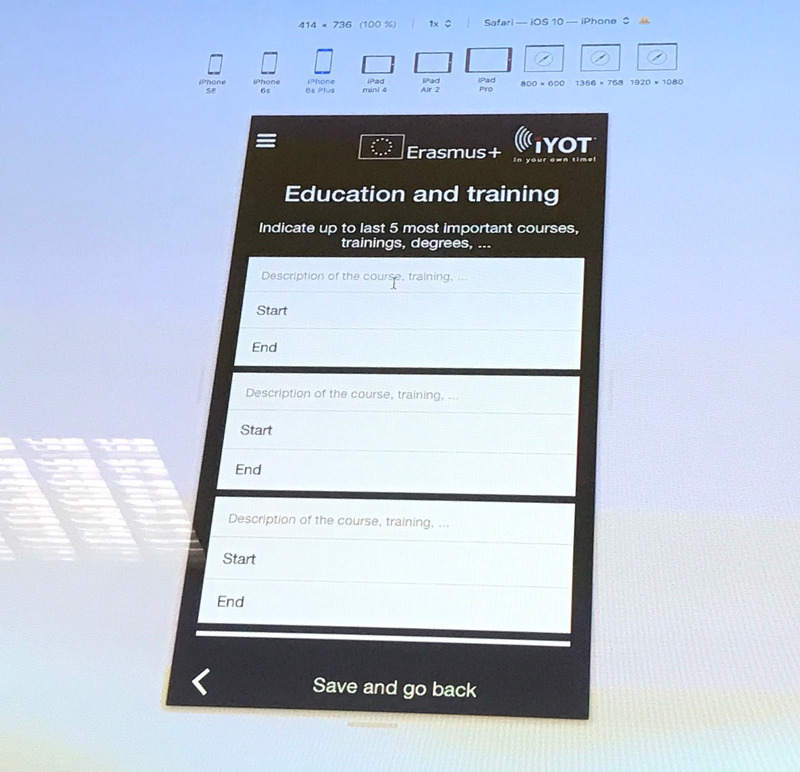 The aim of the iYOT project is to increase the capacity of adult educators and staff of adult education organizations offering different courses, trainings, lifelong learning activities and counselling services to adult participants with fast and effective access to counselling and information. It also pursues an increased involvement of adults in guidance counselling. Thus, on the one hand, by providing counsellors or persons with interest in performing counselling activities with updated and European-based information and an innovative software on which they will be trained, and that will allow them to deliver distance counselling. On the other hand, by providing those users willing to receive counselling, with an individualised feedback that will increase their capacity to undertake new learning, mobility or working opportunities, motivating them for active involvement in lifelong learning activities. For such reasons, the project puts at the disposal of both sides or project beneficiaries – (potential) counsellors and users that want to receive counselling – an user friendly distant guidance counselling service to follow adults interest, skills, personal and occupational developments according to available time of interested user (In Your Own Time), realized in a web-based mobile support system with innovative mobile software – iYOT.